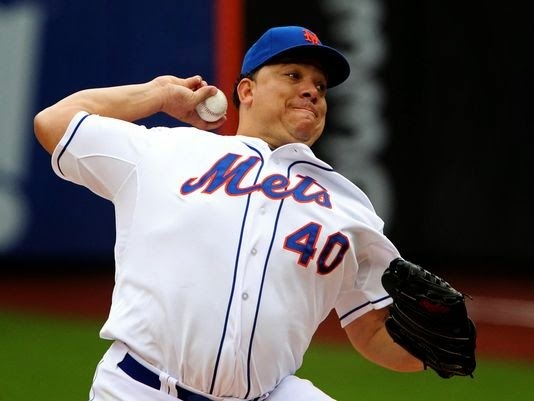 Bartolo Colon: powered by the core. Just as I'd resigned myself to watching the Mets vie for last place in the NL East for the rest of the season, and excoriated myself for caring, they started scoring. And winning. Not writing any encomiums about playoffs or division champs just yet, but c'mon... any flicker of hope is light, eh? This recent wave of hope began with jovian pitcher Bartolo Colon's double during the Cardinals game last Wednesday. Though I didn't see the play as it happened, descriptions included details about how his belly bounced as he ran the bases [note: I'm watching the Tuesday night game against the Oakland As, and because he singled, they replayed the double—I wouldn't call it "bouncing," exactly], and he could hardly catch his breath as Eric Young, behind him, hit another double to score him. More running for Colon. Colon was one of the big ticket acquisitions for the Mets between seasons, and his arrival was met with a mixed reception. He is 40, 5'11", 285 lbs, or somesuch. But he also had a great record last year with the A's, and most importantly, he carries himself with a mix of determination and humor. If he weren't so good at hitting the strike zone, he'd be on the list to replace Mr. Met on rest days. Another emerging secret to the Mets' recent success seems to be, and I'll admit I'm somewhat ashamed—the rally towel. Yes, the prosaic, cookie cutter, default waving of the towel. It emerged in the wake of the Colon Double, and is now ubiquitous and all-purpose. With any man on base, be it hit or walk, the towel twirl is done in the dugout. When a guy homers (like Travis d'Arnaud tonight against the As, freshly returned from a 16-day relegation to AAA), his teammates hold their towels like a matador teasing a bull. When, say David Wright doubles, in the absence of an actual towel, he twirled his fist above his head while standing at second. It has become "a Thing" in just a few days, whether cause or bellwether! I'll end this as the Mets lead the As 8-1 in the 6th inning. I will not take it as an omen that the feed from SNY just cut out completely, just an opportunity to eat dinner while the Mets feast. (PS—the feed has resumed. I mean the SNY feed. Bon appetit. )(Toro towel update, post Chris Young's 2nd homer tonight—they hold their towels and he, like bull, runs through them.) Good night! To know a Mets fan is to love a Mets fan.